We look forward to receiving your registration and welcoming you to the 8th Mallorca Tournament. It is with great pleasure that we are now able to send you the information for the 8th Mallorca football tournament. The Mallorca tournament is being organised by the experienced Mallorca Football Events organization and Viajes Adramar, with the full support of the Calvia Council & the Mallorca Tourist Board. It is a great honour to invite your football team to participate in the 2019 Mallorca tournament. 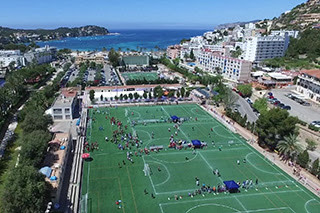 The Mallorca tournament will take place from Thursday 2nd of May up to and including Monday the 6th of May 2019 in the popular and friendly resort of Santa Ponsa. Who can participate: Police Officers, Fire fighters, Custom Officers, Military personnel, Tax Officers, personnel of the Ministry of Interior, state, provincial or municipal employees, staff from the various ministries, and special invitations by the organization.